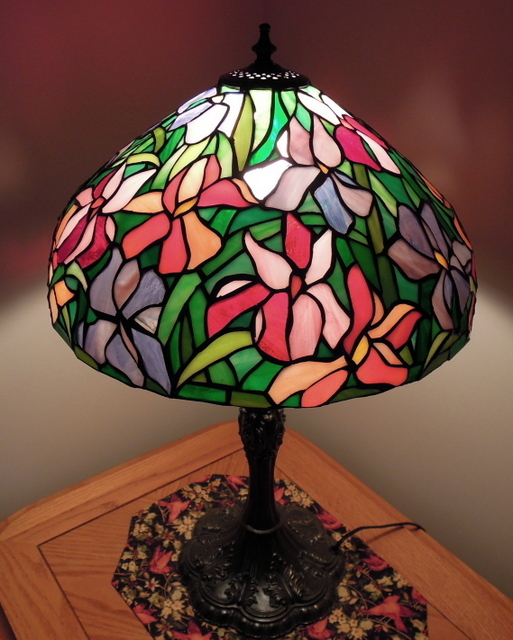 A picture story of a broken Stained Glass Lamp Shade. 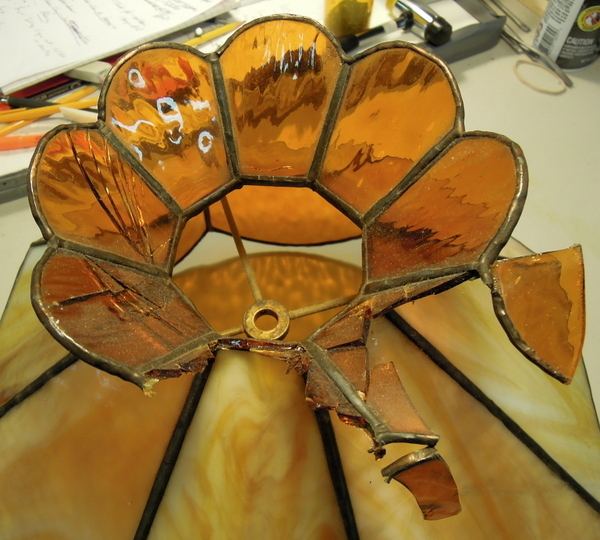 The picture below shows the damage to the lamp’s crown. 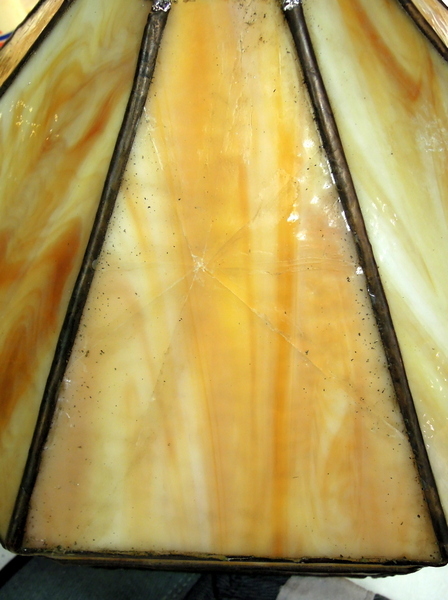 The next photo shows the one large lamp panel with serious cracks in it. This last photo shows the broken bottom panel. There were 4 crown pieces, 1 large panel and 1 bottom panel which were broke. 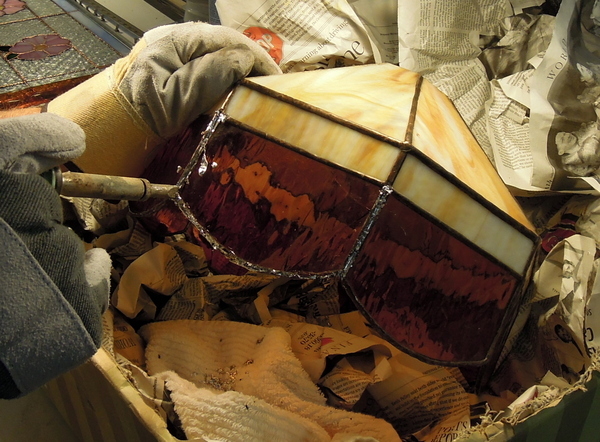 When we take out broken lamp pieces we use a large low sided box filled with crumpled newspaper for support of the lamp shade, then slowly and carefully remove the broken panel. What helps in this process is to take steel wool #0000 only to clean the old solder seams of their dirt and patina, as it allows faster melting of the old solder and less chance for heat build up to damage other pieces. The next photo shows the lamp shade with all of the broken pieces and the crown removed. Then all of the edges need to be thoroughly cleaned and scraped of all of the old foil, using an X-acto knife, #0000 steel wool along with Kwik Clean. Then new foil has to be applied and burnished on to the existing cleaned areas and the new pieces to be used. The next picture shows the crown fully restored. 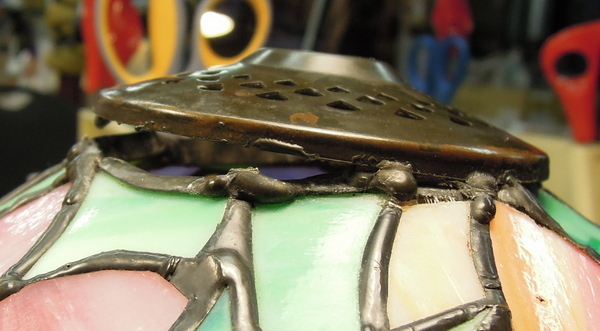 Once all the new pieces have been properly soldered in place, with beading as required along the edges. In this case we did our best to match the soldering techniques used by whoever made the lamp. 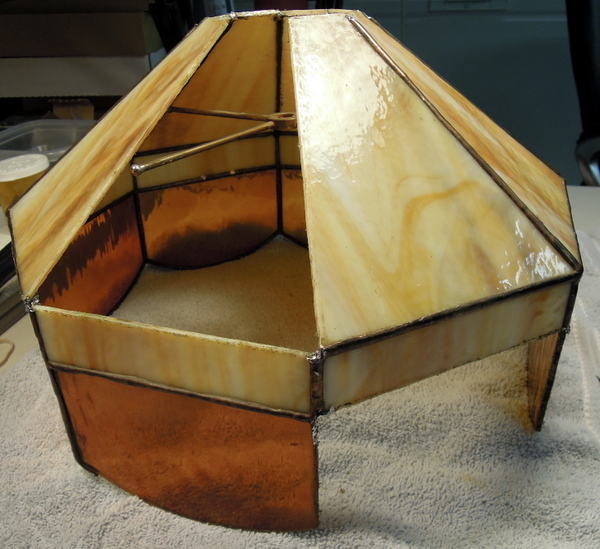 Then the completed lamp shade is cleaned with Kwik Clean to remove flux. We then mixed some black and copper patina’s together to match the antique brass look. After that another cleaning with Kwik Clean, then Clarity stained glass polish applied, with final polishing using soft cloths and tooth brushes for the seams. Then double checking when on a lighted lamp stand which allows to see and find polish etc that we may have missed. We have now finished the restoration of the 1st of 2 old Alberta Rose Came windows. This first one has a rose/pinkish granite background glass. Fortunately none of the background glass was broken however we did have to use some the green leaves, stems and amber border from the 2nd window, which allowed us to make one complete window with all original glass. 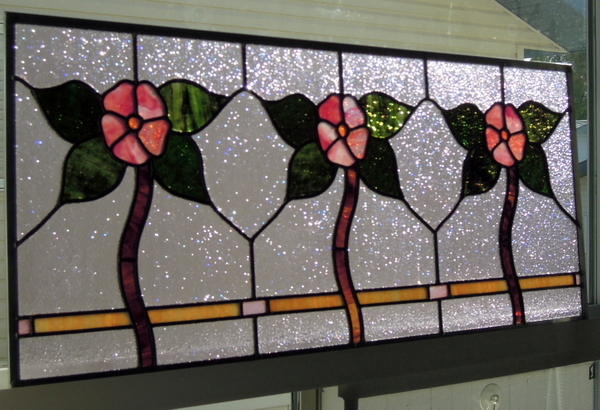 This window was delivered to our client in Stettler Alberta a few days ago. He was most impressed and eventually we will be given photos of where he intends on placing it in his home. The second picture below shows of just how much the granite background glass glistens in sunlight as the sun’s rays change during the day. We love to do these restorations of very old came windows but they are an intense labour of love on our part, requiring many hours of reconstruction from photographing, numbering of each piece of glass, then lots of cleaning of those pieces of glass to remove decades of dirt, paint and grime, then restoring them in new came, soldering, cementing, cleaning and polishing. These windows that have lots of this granite glass takes many hours of intense cleaning with various brushes, X-ACTO knife blades, polishing cloth’s etc. but the finished restoration gives our clients and ourselves a great deal of pride and satisfaction. For the past few years we have been working on and still restoring more of these old came windows. We just wanted to give you a hint of what we have been doing with these old came window reconstructions, and down the road we will have lots of pictures and their unique stories. Some of these windows are over 100 years old and the pictures below show the windows before being restored. 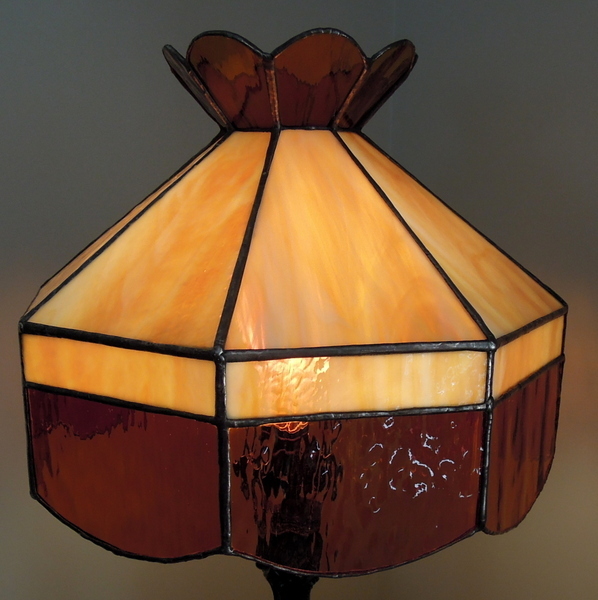 In early March we were brought from Calgary 2 Tiffany Style Lamp shades for repair. 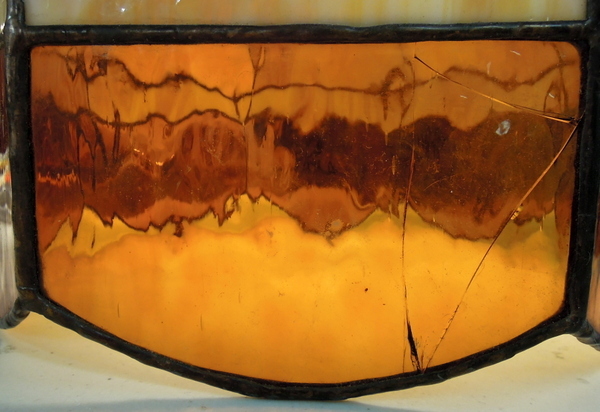 One of the shades vase cape as you can see in the first 2 pictures had pulled away from the lamp. This unfortunately was due to poor attachment of the vase cap to the lamp shade. We had to fully remove this vase cap smooth out all of the solder joints, along with cleaning the cap and joints with steel wool. Always remember when using steel wool the only # that you can use and won’t scratch any glass is #0000. 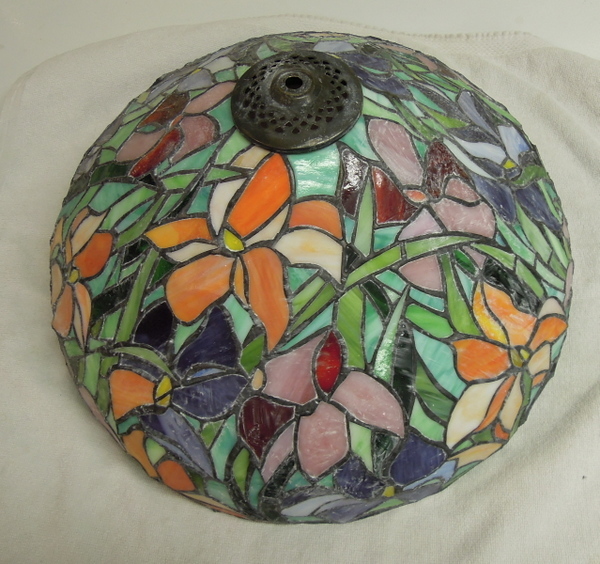 Then we re-soldered the vase cap not only to the outside lamp solder seams but also to all of the inside solder seams and to the top rim of the lamp shade. Then we use Kwik Clean to remove any flux using tooth brushes and compressed air to ensure all of the Kwik Clean has been removed and the repair soldering is clean & dry. Once that is done we applyed new black patina where required, clean again with Kwik Clean. 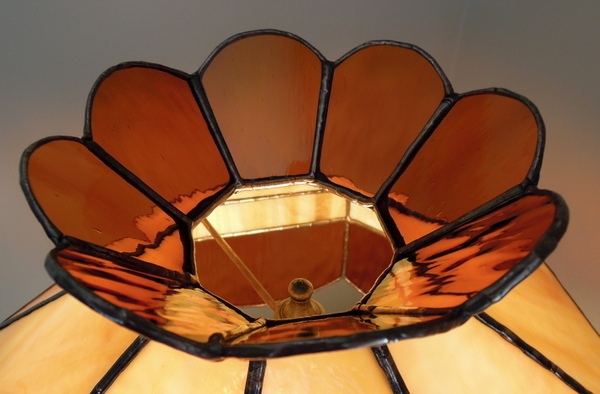 Once we were satisfied with the repairs we then applied Kem Pro polish to both lamp shades inside and out. 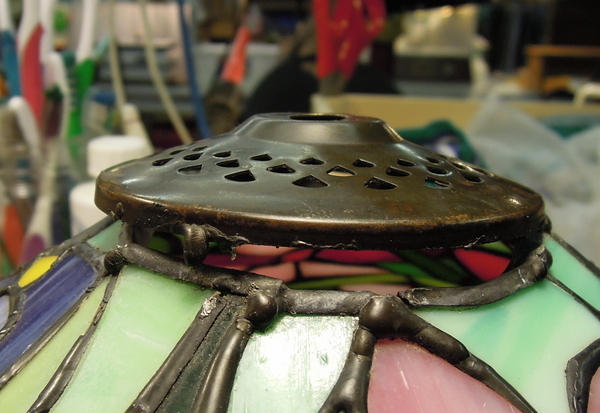 The other lamp shades vase cap was attached ok but we applied additional solder connections on the inside and of course cleaned the flux off, applied black patina, re-cleaned and then applied Kem Pro polish. 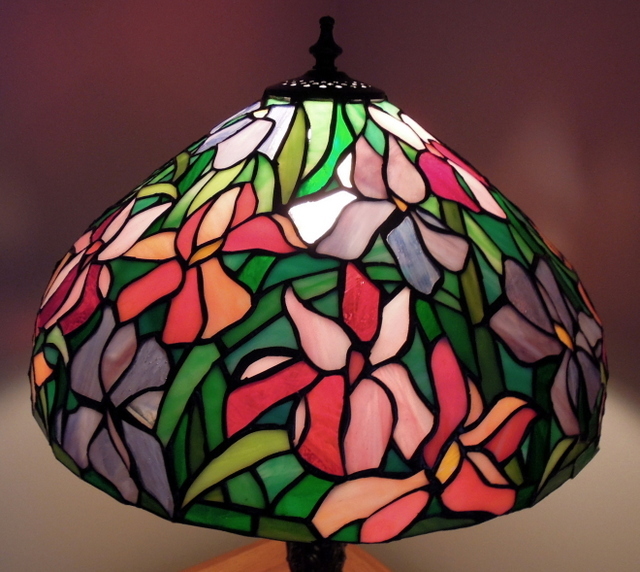 We then use soft cloths along with toothbrushes to ensure that each piece of stained glass in lamp shade is cleaned and brought to a luster shine. 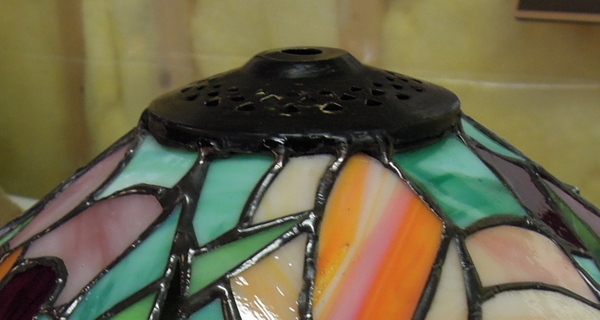 This takes some time due to the many pieces of stained glass in each shade and also both the inside and outside of the shades had polish applied. The final picture shows one of the shades after being polished and ready to be returned to our clients who live in Calgary. Last year we rebuilt and restored this old came window, which included obtaining some new bevels and adding the colored Youghiogheny 5502SP art glass. 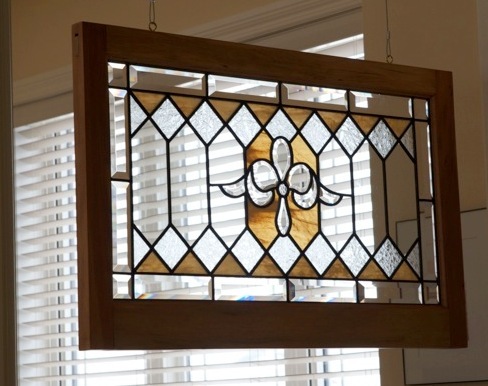 Judy had the restored window mounted in a new wooden frame and it now proudly hangs in her home in Central Alberta.